Lisa is a highly regarded independent lecturer, keynote speaker in trauma, resilience and recovery with a sharp focus on looked after children and the impact on the adult that the child will become. Lisa is a published author of three books with two more coming out in 2016. Working with schools, foster carers and social workers, Lisa is on a mission to provide accessible, scientifically grounded training to all those working with and around trauma, resilience and recovery. Lisa came to Ilona Design looking for a leaflet that would appeal to her most recent target audience, teachers of school children living with trauma. The brief was to provide something professional, educational and transformational. 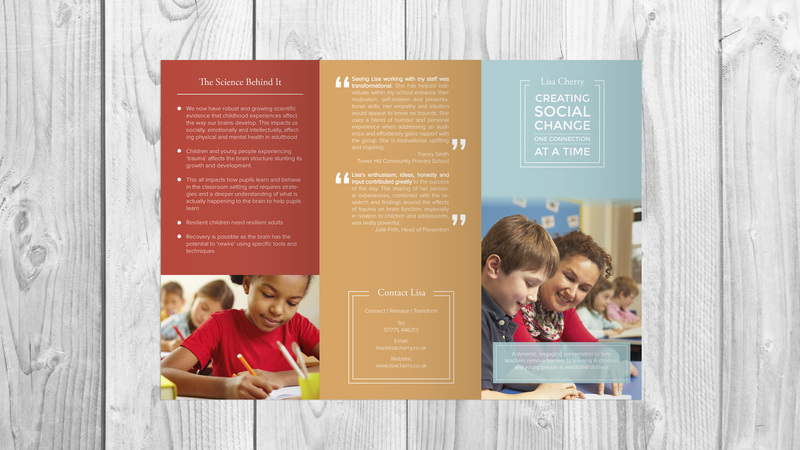 After researching the type of look and feel that would be appropriately palatable to schools, the resulting mood board took inspiration from chocolate, coffee, quotes, love and nature in line with her branding. 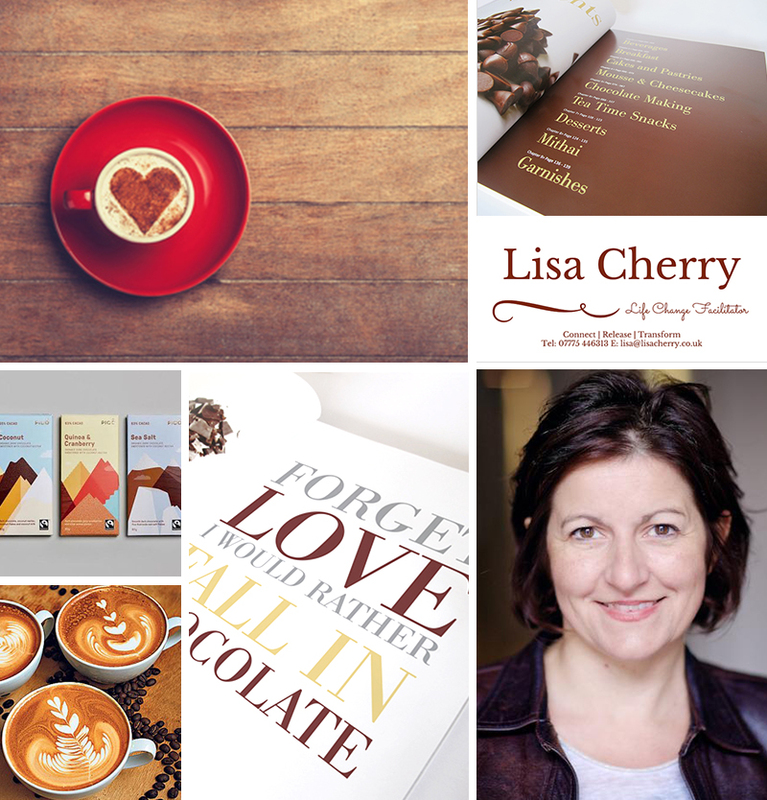 After the layout was crafted, experiments with colour resulted in four initial concepts for Lisa: Milk Chocolate, Dark Chocolate, Soft and Bold. The most popular colour palette was Soft, the design you see here that went to print. Ilona Design also created a corresponding web page on her website, from which you can download the leaflet as a PDF. For more information about Lisa Cherry please visit her website. Louisa is fantastic to work with. She listened to the way I like to work and fitted around me. 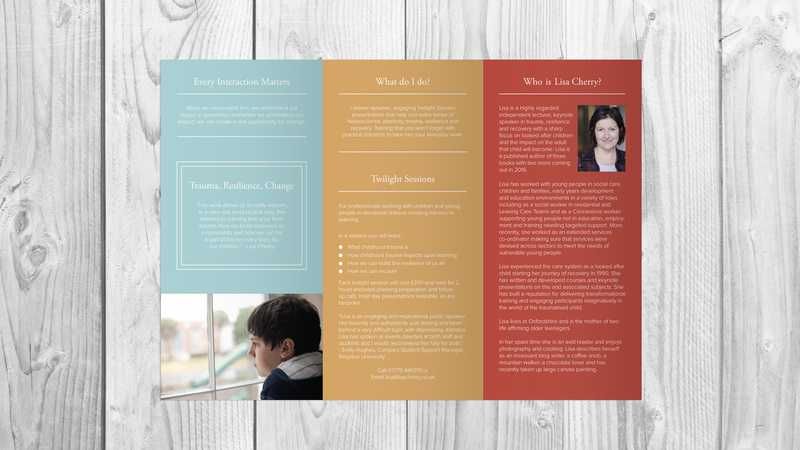 I sent her copy and she transformed it into a beautifully designed leaflet! Amazing!